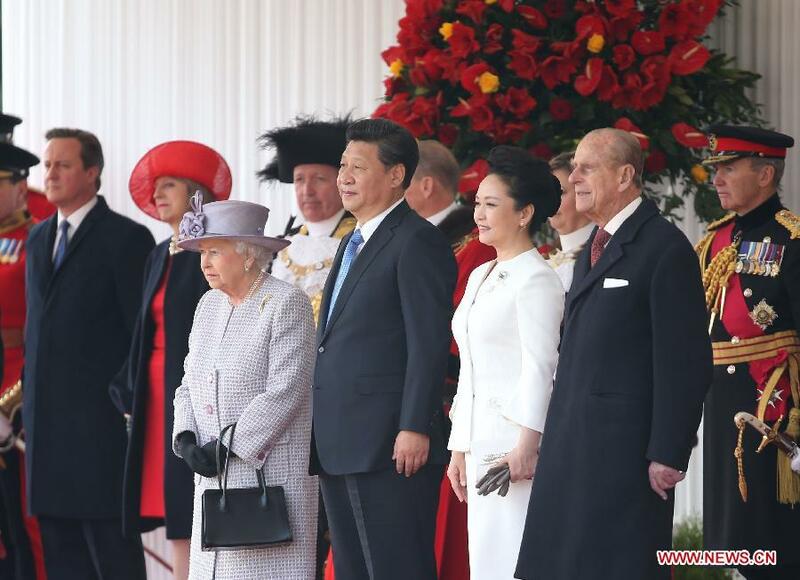 LONDON, Oct. 20 -- Chinese President Xi Jinping received a grand ceremonial welcome by Queen Elizabeth II and addressed the parliament on his first full day of state visit to Britain, which aimed at expanding shared interests between the two sides. Having decided to become China's best friend in the West, London has been waiting anxiously for the state visit, the first one to the European country by a Chinese president in a decade, as it is believed to herald a "golden" era for the bilateral ties. The British royal family hosted an array of welcoming activities for Xi for a long day: the morning greeting, ceremonial welcome, private lunch as well as close talks with the Chinese president. The Queen also held an elegant state banquet at Buckingham Palace on Tuesday night. All the events have been highly symbolic of the great importance the royal family attaches to the China-Britain relations. "Although my visit has just started, I am already deeply impressed by the vitality of the China-UK relations and the profound relationship between our peoples," Xi said while addressing both Houses of Parliament, a privilege only accorded to a few foreign leaders. Xi said he believes that his visit will lift the friendly ties between the two countries to a "new height." 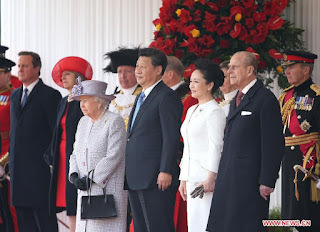 The Chinese president was honored with a gun salute of 103 rounds in unexpected London sunshine at noon as the 89-year-old Queen and the Duke of Edinburgh formally welcomed him and his wife Peng Liyuan at Horse Guards Parade in central London. Xi, accompanied by the Duke of Edinburgh, inspected a Guard of Honor, while the Queen and Peng, dressed in white, stood on the terrace. Then, as the military band played national anthems of both countries, Xi joined the Queen for a gilded state carriage procession along The Mall to Buckingham Palace, where Xi and Peng will stay during their trip. Red Chinese flags and red, white and blue British ones decorated the procession route along which thousands of people cheered and waved hands to the leaders. Following a private lunch at Buckingham Palace with the Queen, Xi and Peng were invited to view a Picture Gallery exhibition of items from the Royal Collection with a Chinese theme. The pair also visited the Palace of Westminster. Earlier in the day, Prince Charles, heir to the throne, and the Duchess of Cornwall greeted Xi and Peng at the Mandarin Oriental Hotel and escorted them to Horse Guards Parade. In the afternoon, the quartet joined again to have tea at Clarence House after viewing a display by The Prince's School for Traditional Arts. Xi also met with Prince William, who made the first high-level British royal visit to China this March since the Queen's 1986 visit. In the evening the Queen held a state banquet at Buckingham Palace for the president and his wife. The enthusiastic welcome from the British side is a "step forward for bilateral ties" and represents "the West and the East warmly embracing each other for a better future," said Fu Xiaolan, a professor at Oxford University. Xi delivered a landmark address on Tuesday afternoon in the Royal Gallery to both Houses of Parliament. China and Britain are increasingly interdependent and are becoming a "community of shared interests," Xi said as being accompanied by British Prime Minister David Cameron, leader of the opposition Jeremy Corbyn and other political figures. The comments came as the two countries' economic and trade cooperation has laid the solid foundation for the China-Britain relationship in recent years. Britain is China's second largest trading partner and No. 1 investment destination in the European Union, as well as a leading offshore RMB trading center only after Hong Kong. Robin Niblett, director of the Royal Institute of International Affairs said Britain is a great platform, "from which China can go global." "The United States helped drive global growth after the World War II ... by giving the world the boost. I think this (British) government sees China as the boost for the next day's global economy," he said. "It wants to be part of that and is going to make sure it's part of that." On Wednesday, Xi will hold talks with Cameron. A number of deals are expected to be signed between governments, financial institutions and enterprises in various fields.